RussJones.Us: A Pot of Gold At The End Of The Rainbow. It is St. Patricks day this weekend. This week I ate at a favorite Irish restaurant and came to this conclusion. I'm not going there this weekend. Everything was green, and I mean everything! So where did this whole idea of Leprechauns, pots of gold and rainbows come from? Well, the myth goes like this. Once upon a time, the Vikings lived in Ireland, looting and plundering they burying their ill-gotten treasures all over the countryside. When they departed from the Isle, they inadvertently left behind some of their gold, which the leprechauns found. To ensure no humans could take what they now considered their gold, the leprechauns reburied it in pots deep underground all over the island. When rainbows appear, they always end at a spot where some leprechaun's pot of gold is buried. 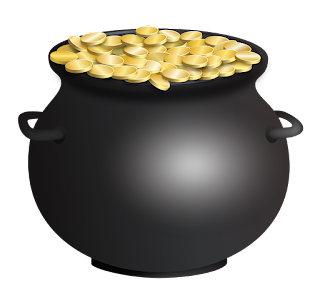 Believers who've searched for the legendary pot o' gold always end up stymied, because they can never find the rainbow's end. How here is the science. It's true rainbows appear to form perfectly rounded arches. But in reality, rainbows form full circles. When we are standing on the ground, we can only see the light that's reflected by raindrops above the horizon. Thus, we can't see a rainbow's lower, hidden half. If you're are in an airplane, or climbing a tall mountain and can see below the horizon – you might see a rainbow as a full circle. Rainbows seem to move when you do because the light that forms the bow is always at a specific distance and angle from you. A rainbow is an optical illusion. That's why you'll never find your pot of gold. There is a lot I can do with this so I will keep it short. Don't believe leprechauns. The world will sell you on a bill of goods that don't exist. After you've done everything they told you, which didn't get you want you wanted, then you will hear the phrase, "Oh, well you need to do this now." Or, "You didn't do it right." Or, "Apparently this isn't for you." The closer your relationship with God is, the more you will see. It is evident that if you can see the whole rainbow, you will know that there is no end or pot of gold. God will raise you up above the world and let you know the truth of its madness. If what you are chasing keeps moving, stop running. This is the definition of being a rat in the rat race. If someone else is pulling strings it's to their own benefit, not yours. Stop playing their games.